My name is Lucinda. I was born in Guatemala in the west of the country, in a town that borders on El Salvador. My parents are Guatemalan. I am the seventh child of 9 brothers and sisters. I am a member of the Sisters of St. Clare and I would like to share a little about how my vocation to Religious Life started. One Sunday while in Church I was invited to a meeting with other young people and we were told a little about religious life. A question we were asked was “What would you like to do with your life?” I didn’t know how to answer but the question stayed with me and I asked God to guide me to choose my vocation. Was it to marriage, the single life or religious life? I was 15 years old. Some time later I was invited to visit the Sisters of St. Clare in El Salvador. I was a bit frightened leaving my own country but I agreed to go. I stayed with the sisters in their convent in El Salvador for 15 days. The experience was very good for me and I was impressed by the work the sisters did among the very poor. They were passionate at what they did and I was touched by their love and spirit of joy. The sister who had invited me to the community in El Salvador was the instrument God used to help me see that He was calling me to follow Him in religious life. I was now 18 and I expressed my wish to join the community and become a Sister of St. Clare. 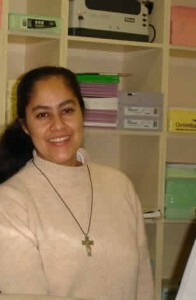 For two years I was a postulant in San Francisco, Gotera which is about four hours from the city of San Salvador. During this time I took part in the life of prayer in the community, worked in the parish with the other sisters and did some study in preparation for university. At the end of this period I was accepted into the Novitiate where I deepened my understanding of religious life, and learned more about the Charism and Spirituality of St. Clare. The noviciate lasted for two years and when completed I took vows of Poverty, Chastity and Obedience, finally after a further six years committing myself for life as a Sister of St. Clare. In 2007 I came to Ireland to learn to speak English. This was a wonderful opportunity to meet and share with the sisters in the different communities. On my return to El Salvador I will be working in school and in the parish with the very poor.